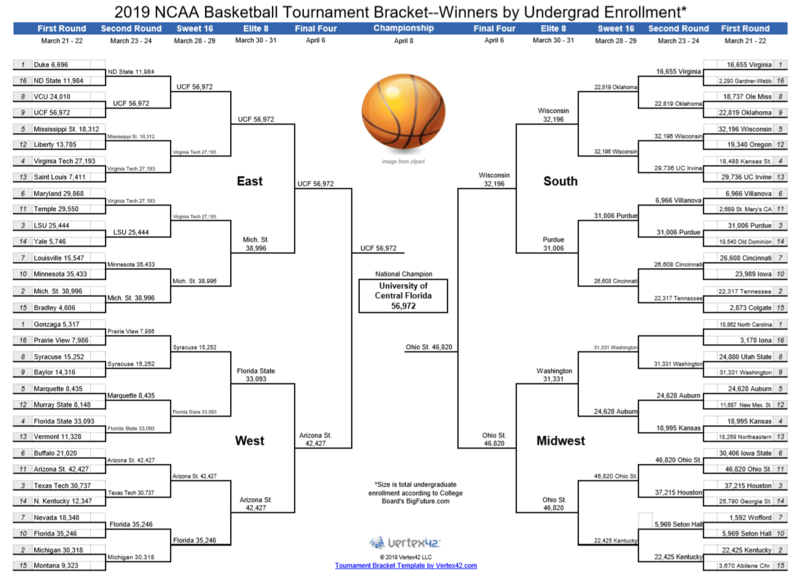 You are here: Home / Studying / March Madness and College Admissions: Who Will Win the Bracket(s)? It’s that time of year again: March Madness, when the sports world loses its collective head over the wins, losses, and upsets of college basketball teams. 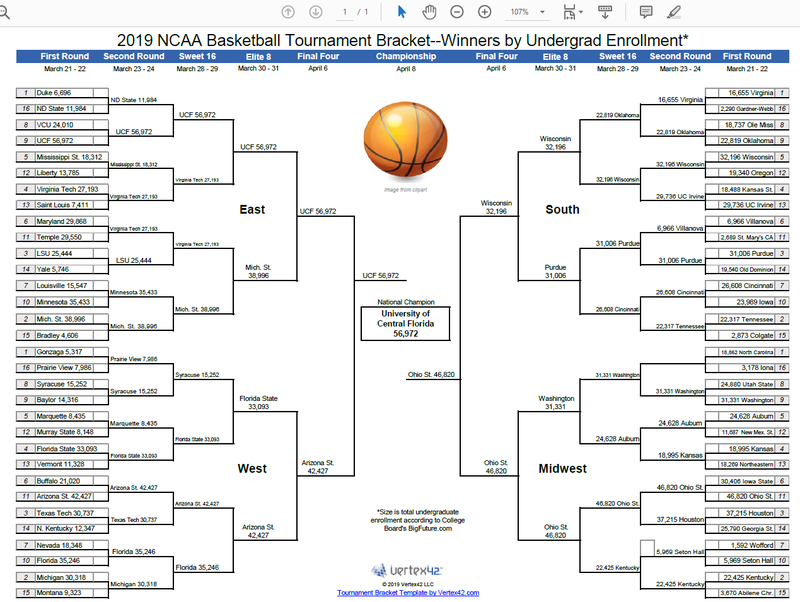 While I’m a huge fan of March Madness myself, and will probably be looking for my said-head come Friday night (particularly if Michigan State decides to bow out early again this year), I also understand that there is so much more to a college or university than its sports programs, which is why I’ve made my own brackets based on the teams in the NCAA tournament. I’ve scoured College Board’s BigFuture website to bring you some intense competition in enrollment size and college costs. The first bracket determines the colleges that have the greatest undergraduate enrollment. For each “game,” the college with the largest enrollment moves on to the next round. The winner (at least for those who are looking for a large university experience)? The University of Central Florida with 56,972 students! The college with the fewest students is Wofford at 1,592—and maybe this makes Wofford a winner for you (I also happen to know that they are ACT/SAT optional, which may sweeten the deal). It just goes to show that colleges of all sizes can have exciting athletic events and talented teams. 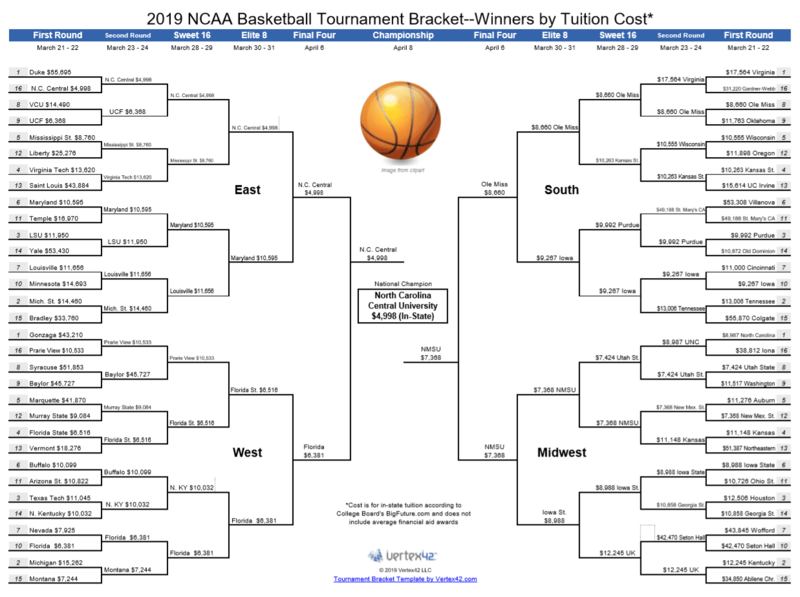 The next bracket looks at the cost of in-state tuition, again provided by BigFuture. The least expensive college advances to the next round. Note that these prices do not include financial aid. As you’ll see in the next bracket, financial aid can make some of the most expensive colleges quite affordable. The college in the NCAA basketball tournament with the lowest in-state tuition is North Carolina Central University, coming in at $4,998. The two most expensive are Colgate ($55,870) and Duke ($55,695), but before you discount them for being too costly, keep reading. 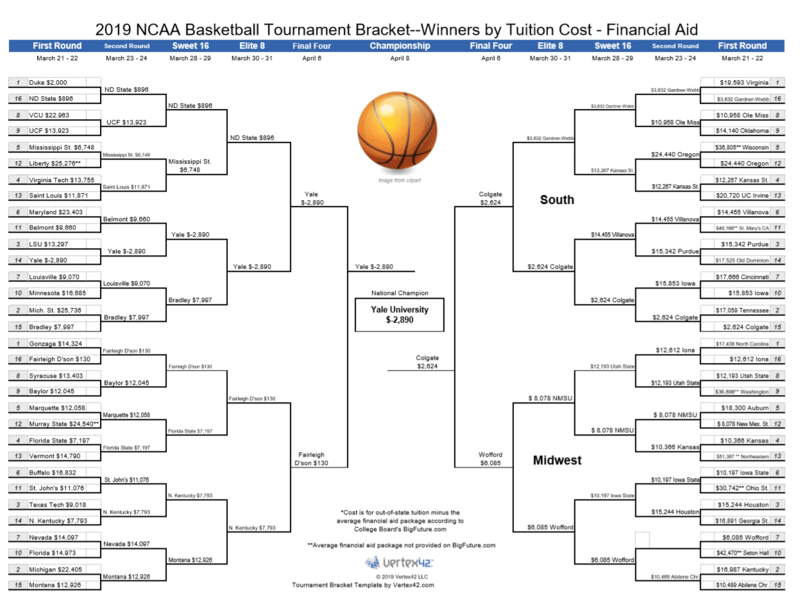 The final bracket subtracts the average financial aid package from the cost of out-of-state tuition. It proves that it pays to study for the ACT and SAT: Yale University actually gives out $2,890 more financial aid, on average, than the actual cost of tuition. 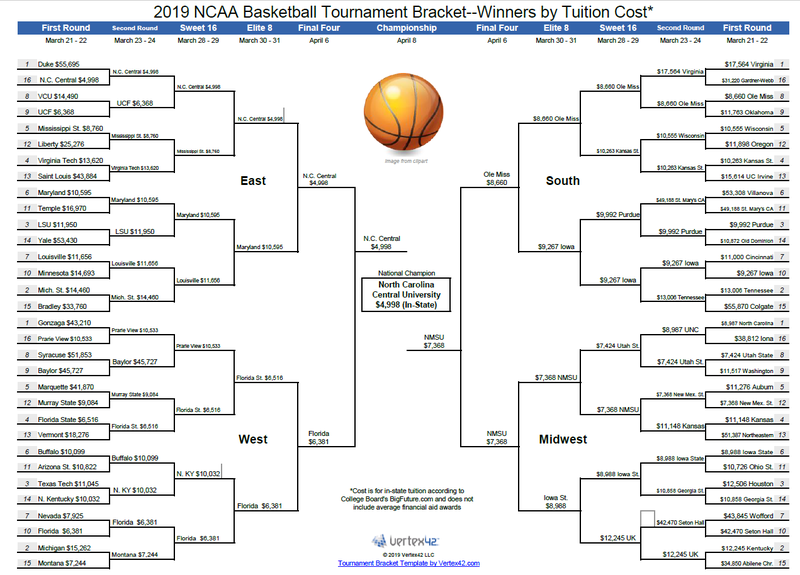 I think the most important thing you can take away from these brackets is that many private colleges that may seem cost-prohibitive are actually more affordable than public universities for those who qualify for need-based assistance! Colgate and Duke, the two most expensive colleges in the previous bracket, would only cost $2,624 and $2,000, respectively, if you are able to score their average financial aid package. 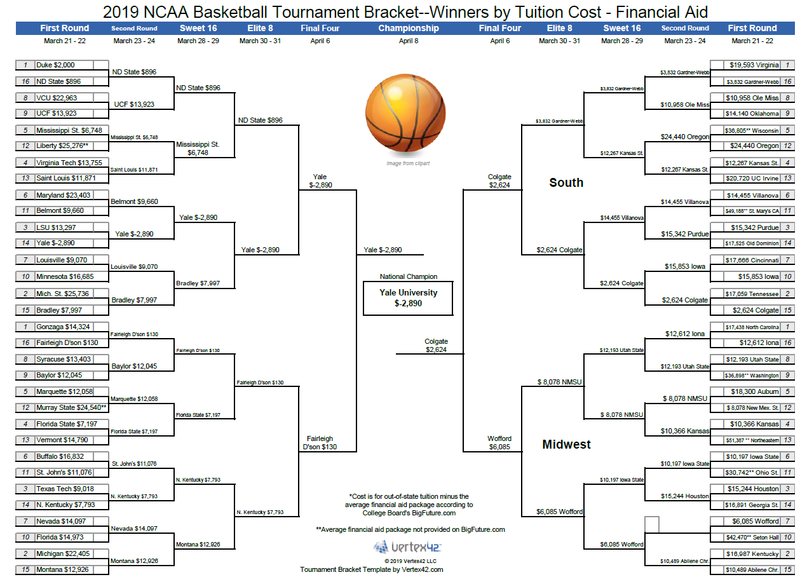 Some colleges did not provide BigFuture with their average financial aid package, so it’s impossible to say which team is the “biggest loser” in this bracket. Interestingly enough (at least to me and my never-ending-student-loan-paying wallet), of the schools that did supply their average financial aid award, my beloved alma mater comes in at the highest out-of-state tuition minus average financial aid. It’s going to cost you $25,736 in tuition to go to Michigan State from out-of-state if you receive the typical financial aid package. This better be the only bracket in which my Spartans lose this week. If all goes well, we’ve got a date with Duke the last weekend in March and it will be Blue Devil fans whose heads are rolling afterwards. Go Green!